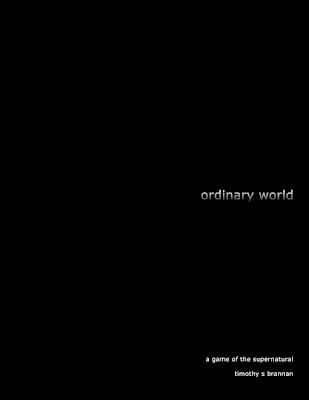 Ordinary World was the working title of a new game I was working on. It was going to be modern supernatural and use this new system I was developing that I had code named "The Power of Three" system. The basic premise of Ordinary World was the players would be playing supernatural types just trying to get along in a world that didn't believe they existed and considered them monsters. In a way sorta like "Being Human" the RPG, but also elements of all the things I like in modern supernatural fiction. I wanted to have the experience of writing a new game from the ground up and I wanted to do something in a realm I am really familiar with. Trouble is every time I would bring this game up to friends they would remind me I already did all of that with Ghosts of Albion. So sometime this past Summer I shelved Ordinary World. No sooner had I done that than I had this great idea for an Old-School game that I was calling Monster Mash. The rules would have been Labyrinth Lord compatible and instead of heroes you would have played the monsters. In particular the old Universal Pictures Monsters, so vampires, golems, werewolves and ghosts. I would have made it compatible with The Witch since one of my big influences for this was the video to the Rob Zombie song, American Witch. I thought it might have been a fun beer and pretzels sort of game. In truth I probably came up with it while listening to Hellbilly Deluxe one too many times. I even had an adventure partially written "Dr. Satan Needs Blood!". Last week I was still thinking about these two when I had an idea of bringing them together. When it also dawned on me that I had other WiPs, some from the earliest days of this blog. Generation Hex was this really cool, awesome idea I had for Unisystem/True 20/Mutants & Masterminds or whatever system I happen to really enjoy at the time. Simply put it was a game to play kids in a magical school. Since that time this sort of thing has been better done by Witch Girls Adventures. I also have material laying around for Licensed properties that never saw the light of day and I am now the owner of again (the RPG material, not the properties). One was d20 and the other True20. So. What's a guy to do? Well the natural thing is to bring them all together under one system to do the one thing they all kinda of were doing anyway. I want to use an old-school system. I think it would be a great addition to all the material we have out there now and NOT redo something everyone else has already done. I want to be able to play any character I want. If I come up with an idea or see something in a book then I need to have a system that can do that. While it is an Old-School game, I don't want to forget about the advances made in other games. There are a lot of great games out there and they are great for a reason. This my chance to distill that into a new game. So. Look for more information coming from me on this. I think this is one I will design live on the blog. Posting ideas, sending up files for playtests. Things like that. First thing I need to figure out. What system should I use? Nice! Swords & Wizardry is always my first choice for a system you can bolt things on to with very little effort. It's so open-ended you can really do whatever, but for more internal consistency perhaps LL is the best choice. People are gonna use it interchangeably anyhow, knowing the OSR crowd. Swords & Wizardry is a great choice for the OSR route. That ruleset definitely has a DYI ethic built into it. Have you thought about the d6 system or the WaRP system (from Over the Edge by Atlas Games)? Oh! And since you name-checked Mr. Zombie, go see his "Twins Of Evil" tour if you get the chance. It'll melt your face!